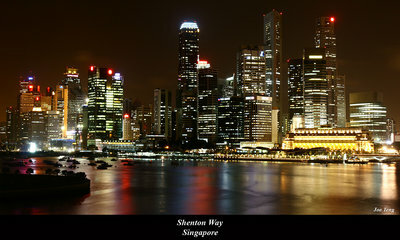 About This is singapore central business district at night. It was taken on a bridge. Thanks James! I will look for you man! this is a good nightscape/cityscape joe. well done. i've never been to singapore but may come down that way to try catch photos of an electrical storm. Remarkable nocturnal cityscape,love ur balanced exposure so great with wonderful effects,congrats!!!!!!! Thank Vinicius! Singapore is a paradise for photographers! Visit my small country and i think you will get a handful of beautiful photos! WOoooonderful picture, Joe ! great visual of colors! Thank Lori! Thank for your many comments on my work! You have a really nice portfolio, sooo many great images. Hi Hugo and the rest of the guys! Thank guys for your recent comment on my humble work! Wish you all the best in you work too! Splendid nocturnal cityscape! Very well done and composed. great shot! perfect exposure, the colours are excellent..
Amazing night work. Keep up the good work! Great view on city.Nice colors. Beautifull Singapore central business district. Very good composition and exposure time. Beautiful cityscape shot Joe. Brings back good memories I have on the Lion City. Nice cityscape, just like for some postcard. Thank Megan for your kind comment! Joe, I love all your night shots of the city. They are so crisp and the colors are fantastic. Nice work. So beautiful! Great composition. The sea is so calm it looks like marble..:) Excellent night shots, very colorful lights. Congratulations. Thank Saeed! I love your shot as well. Very beautiful! glad to meet a photographer like you! cheer! Thank for your comment. i will try the method you recommended. It will be real hard cos i am taking this photo on a expressway and the vibration on the road is too great so no choice the photo are usually shorter exposure. I have been told that this is the best city in the world, well it looks a little bigger than where I live. this is a great long exposure shot. would it be about 30sec, what I would like to see you get is a release cable and stick your camera on bulb at f22 and should be able to expose for like 3-4 mins. The lights will turn into stars and the water will even be more flatter. I like a lot your effect on the water. Beautiful night shot...Love the effect of the water. Hi Joe, Superb long exposure city scape. The soft patterns in the flowing water are excellent, as is the exposure. Very crisp and clean. My compliments! Thank jas for your time! cheer! nice and sharp, it's been a while since i go up to the bridge..This is well taken. Thank Stephen! If you ever visit singapore, just send an email and i can recommend some interesting places to visit. cheer! Great light reflection in the water. Wish the top of the highrises had more lights on to illuminate them a bit more - they seem to fade a bit into the darkness. Thank Michael for your kind comment! What a beautiful place, nice city scape!